Svoronata Kefalonia: Svoronata is a small beautiful village on the southern side of Kefalonia. 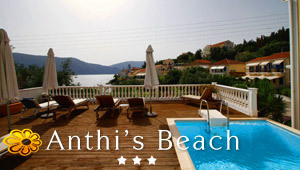 Only 9 km from Argostoli, the capital of the island, Svoronata is also the closest village to the airport of Kefalonia. A village with interesting samples of local architecture, Svoronata is found close to lovely beaches, including Ai-Helis, Avithos, Ammes, Platis Gialos and Makris Gialos. All these beaches have crystal water and soft sand. The surrounding region is lush green and well-developed in tourism, with hotels, studios and seaside taverns.